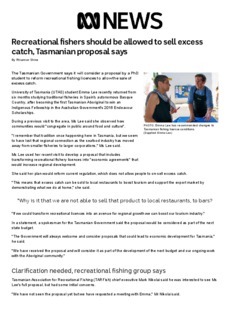 The Tasmanian Government says it will consider a proposal by a PhD student to reform recreational fishing licences to allow the sale of excess catch. University of Tasmania (UTAS) student Emma Lee recently returned from six months studying traditional fisheries in Spain's autonomous Basque Country, after becoming the first Tasmanian Aboriginal to win an Indigenous Fellowship in the Australian Government's 2016 Endeavour Scholarships. During a previous visit to the area, Ms Lee said she observed how communities would "congregate in public around food and culture".